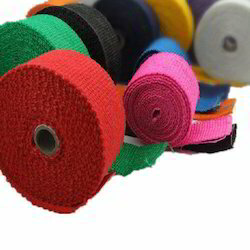 Manufacturer of a wide range of products which include ht insulation tape, mica coated ceramic fiber tape, industrial kiln materials ceramic fiber tape, stainless steel reinforced ceramic fiber tape, industrial ceramic fiber wrapping tape and industrial webbing tape. HT Insulation Tape Woven Tape is fabricated from high quality type E fiberglass that will not burn and will withstand continuous exposure to temperatures of 1100°F / 593°C. These high temperature tapes provide protection of industrial wires, cables, hoses, tube and pipe and also provide thermal insulation and personnel protection. Also used as a gasket or seal. Available as a Plain tape or ladder tape. Available . It is available with adhesive backed, also available for colored fiberglass tape. Fiberglass offers excellent heat resistance, retaining more than half of its room . Mica Coated Ceramic Fiber Tape high temperature resistant up to 1050 ° C, ceramic fiber textiles feature excellent properties of lightweight, low thermal conductivity and chemical stability resisting attack from most corrosive agents. They are widely used in thermal insulation industry. 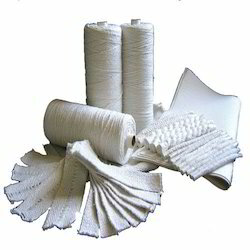 Ceramic fiber tapes are made of ceramic woven yarns with fiberglass yarn or steel wire reinforcement. Packaging Details: 5Kg OR 10 Kg per Roll Weight. 100% Dust Free Packing. Every Bag wills Be At Best Quality Packing. Per Roll will Be Pack in a Plastic Packaging. Thickness, weight & Meter Detail's Be on an Each & Every Roll's. Free Sample Available : Yes, Available Free Sample As Per Your Requirement. 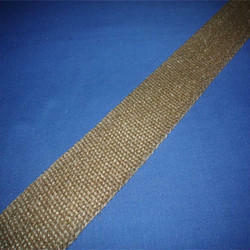 CERAMIC FIBER TAPE is a woven fabric made from our high quality ceramic fiber woven yarn. It is featured with heat insulation and high temperature protective materials in all kind of thermal installations and heat-conducting systems, widely used in welding, foundry works, aluminum and steel mills, boiler insulation and seal, shipyards, refineries, power plants and chemical plants. 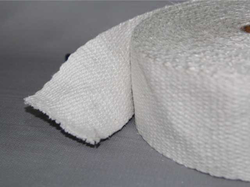 Ceramic fiber tape is made from Ceramic Fiber yarn, it is a cost-effective insulating tape. Reinforcement by glass filament and steel wire for increasing the strength retention at elevated temperature. 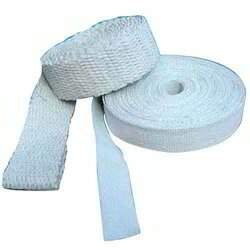 Substitute for asbestos tapes. Ceramic tape is a high performance industrial tape made from zirconia grade ceramic fiber yarn. Ceramic fiber is standout among the different organic and inorganic fibers. The packings are made from high quality ceramic fiber; it has excellent capabilities of high strength and high temperature resistance. 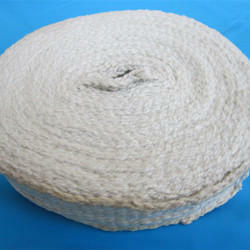 Ceramic Fiber packing with PTFE impregnation Made from long ceramic fiber yarn impregnated with PTFE and additives. Has low coefficient of friction and resilient and flexible. Universal packing, for rotary, reciprocating pumps, in ship building and domestic fresh water pumps. Suited for chemical neutral and resistant to water, steam, hot air, oils, etc.